The Lite Series 3MP Outdoor Network Dome Camera with 3.6mm Lens and Night Vision from Dahua Technology has a 1/3" progressive scan CMOS sensor and a 3.6mm fixed lens to capture 2048 x 1536 resolution video at up to 20 fps. IR LEDs allow the camera to produce clear images in complete darkness of objects up to 98' away. 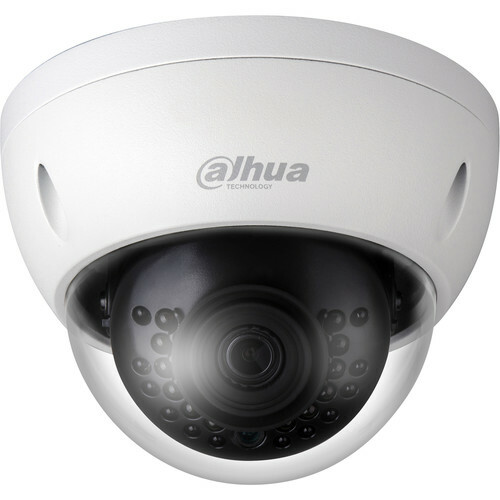 Its 3.6mm lens captures a 81° field of view to monitor both indoor and outdoor areas. The camera is housed in an IP67- and IK10-rated enclosure for protection against dust, water, and impact. Box Dimensions (LxWxH) 5.5 x 5.4 x 4.7"